Who loves mini-golf? The whole family does, mom, dad and even the kids! 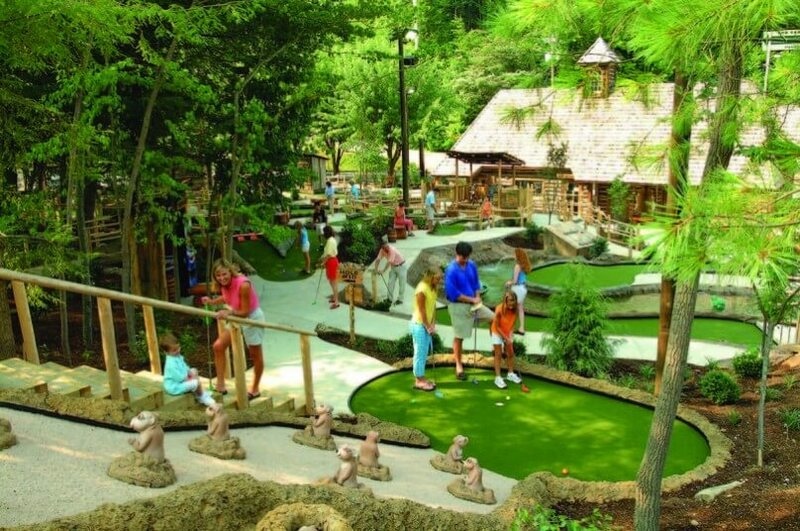 In the Smoky Mountains, your family will want to play all the mini-golf courses. Let’s take a peek at them to see which one you might want to try first. Here they are: Circus Golf, Ripley’s Davy Crockett Mini-Golf, Ripley’s Old MacDonald’s Farm Mini-Golf, and Firehouse Golf. Circus Golf in Gatlinburg—If you like the circus and like mini-golf then you’ll love Circus Golf with Barnaby’s Animated Circus Show. This 18 hole family golf course is half fun house, half golf with a special FX blacklight—wow! This is not your average mini-golf. It’s a must see and play for your whole family. Ripley’s Davy Crockett Mini-Golf—This course replicates the “old days” when Davy Crockett roamed the hills of Tennessee. Located in the Great Smoky Mountains with an amazing 18 hole course of pure mini-golf family fun. Enjoy interactive displays and animated animals as you try to get that hole-in-one. Ripley’s Old MacDonald’s Farm Mini-Golf—Just outside Gatlinburg in Sevierville. Your family will have loads of fun with this 18 hole mini-golf course including, animated barnyard characters and interactive excitement and water features at every turn. Not to mention a state-of-the-art arcade and candy factory! You’ll have so much fun at your mini-golf outing, that you may want to do all 36 holes in one day! So have fun in the Smoky Mountains and Sevierville with Davy Crockett and Old MacDonald. Find out more in the Mini Golf section. Play Gatlinburg’s Most Entertaining Mini-Golf! 36 times the Fun for the Entire Family! Two Amazing 18-hole State-of-the-Art golf courses with interactive displays and animated animals. All New Spinning Course Challenges that will bring more excitement, fun and challenges to your mini-golf game! Free parking or ride the Trolley.